The Monday Night Football games over the last few weeks have been a little lackluster but this week’s Monday Night Football match up could not be any better. Aside from being bitter rivals, The New York Jets and the New England Patriots both come into this week with a 9-2 record and will face off on Monday Night Football for first place in the AFC East. The average ticket price for this week’s Jets – Patriots game is $232.31 which is 124% more expensive than last week’s Monday night game featuring the San Francisco 49ers and the Arizona Cardinals. The last Monday Night game with a similar demand for tickets in the secondary market was back in week 7 when the New York Giants played the Dallas Cowboys in Arlington. 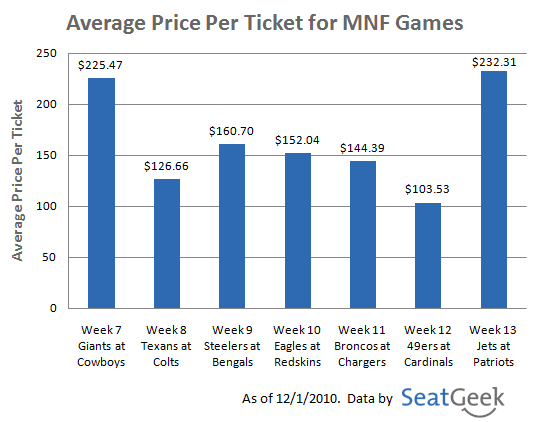 It is actually surprising that the average price per ticket to this week’s MNF game is not higher considering the Giants @ Cowboys averaged just about the same amount as this week’s match up. Although Cowboys – Giants is a big rivalry, the Cowboys were 1-4 going into their Monday Night game against the Giants while the Jets and Pats are both top ranked teams playing for first in the AFC East. Let us know who you think will come out on top this Monday night in the comments or on Twitter @SeatGeek.